The taggers of today aren't using paint - they're using glass etching fluid and diamond-tipped tools to create markings that cannot be washed away. Anti-graffiti film is an affordable, clear, UV rejecting, replaceable layer of protection for your windows. Anti-graffiti window film has saved Chicago small business owners thousands of dollars on glass replacement. One standard-sized tempered piece of glass can easily cost over $1000 to replace. You could have a protective layer of anti-graffiti film replaced almost a dozen times before matching that cost. If your business is located in an area prone to vandalism, you can't afford not to have anti-graffiti film installed. Anti-graffiti film represents over 75% of our commercial storefront business - more than any other window film company in the city. If you haven't already had your windows treated by us, odds are your neighboring business has. Our installations look great and always use high quality 6-MIL multi-layered anti-graffiti film. 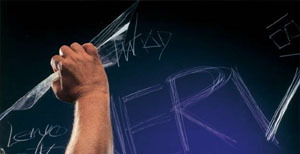 Anti-graffiti film requires training to properly install and safely remove if you don't want to damage the glass while the work is being done. 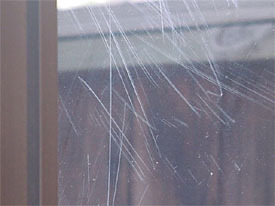 We have seen hundreds of windows scratched beyond repair by inexperienced installers. We strongly encourage you to have the work done professionally, or not at all. Remember - keeping your storefront beautiful is the whole purpose of having the film installed! We want your business to shine! Is your old graffiti film tagged or starting to look dull? Let us change it out! Once we have applied our graffiti film to your windows, we offer up to a 25% discount on each piece of film you need replaced. We know of no other service in Chicagoland that offers such a value. Join the other Chicago businesses that trust their windows to Precision! If you are interested in anti-graffiti film, give us a call at 800-683-8468 or send us an instant message today! Learn more about Anti-Graffiti Window Film in Our Blog!